An ugly wasteland, an indomitable dream, a legacy of love. By Suvi Mahonen. What are the early warning signs of dementia? And is there any way to prevent it in the first place? Vania Chew says the answers may be simpler than you think. 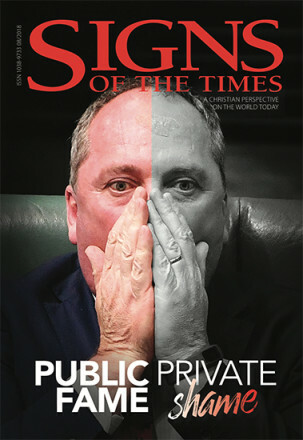 Should we judge public figures by their private behaviour? And, asks Mark Hadley, what does this dissection of others’ misdemeanours reveal about the darkness in our own hearts? If you’re a slave to your work, you need the perspective and practical tips offered here by Bruce Manners. In his years as a counsellor, Jeris Bragan has found that, despite anger and trauma, most of us have a deep need for a loving and powerful Father. Open up and say ha ha ha ha. Doctor’s orders. By Julie Guirgis. Followers of Christ are among the most persecuted people on the planet, says James Standish. What motivates them to continue in their faith? In baptising her son, Melissa Howell experienced the power of this most ancient of Christian rites. Many people struggle with questions of purpose, meaning and identity. Kent Kingston is no exception, but finds the Bible is a great place to look for answers.